Hey there anyone who stumbles across this blog and goes "hmmm, does she actually ever update it?"! Maybe 2019 will be the year that the answer to that question is more "yes" than "no". 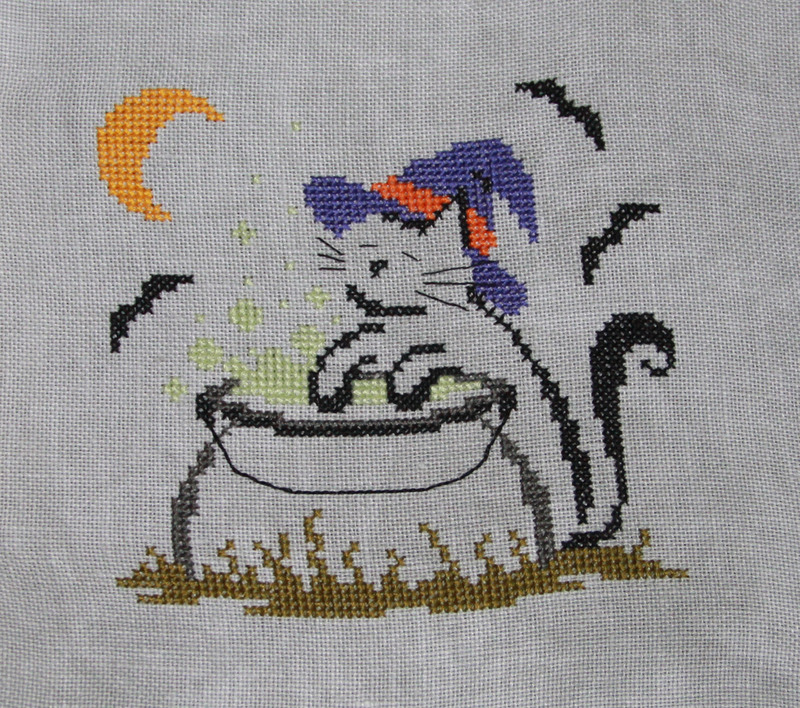 I did actually do a little stitching last year after stumbling on the cross stitch subreddit and getting inspired to find a way to get more stitching time in to my schedule. 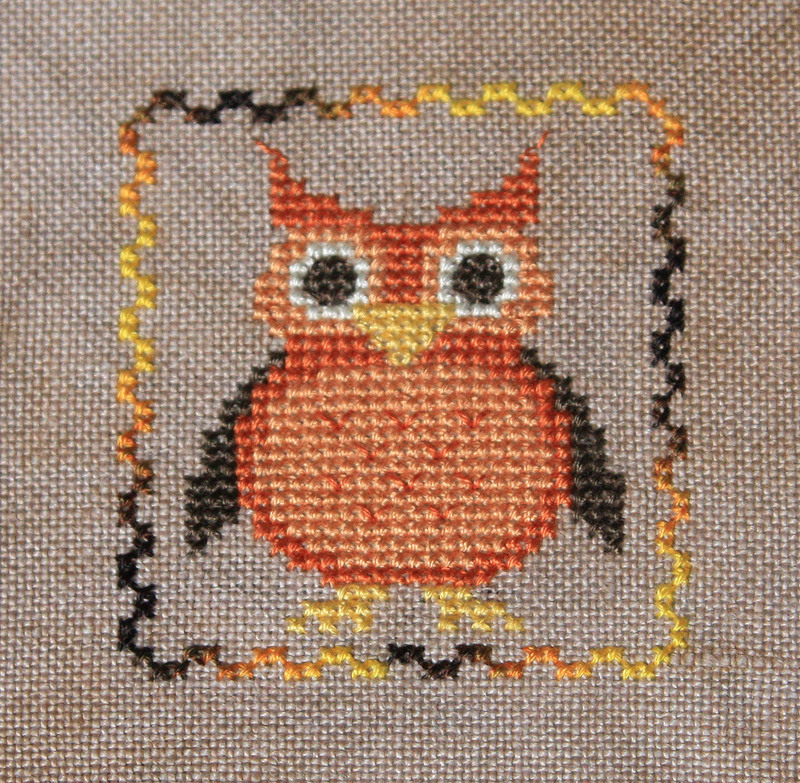 And part of the reason that I haven't been stitching quite as much in recent years is that I've started to have trouble with my eyes, so I have to do it all with a magnifying lamp at my desk for now. And I finished the Haunted House that I mentioned here into a little pillow ornament. Although I was apparently *really* rusty since I didn't do a very good job on the stuffing and stitching to make it into a pillow! That's it for recent stuff. Now let's see if I can post a little more before the end of 2019! 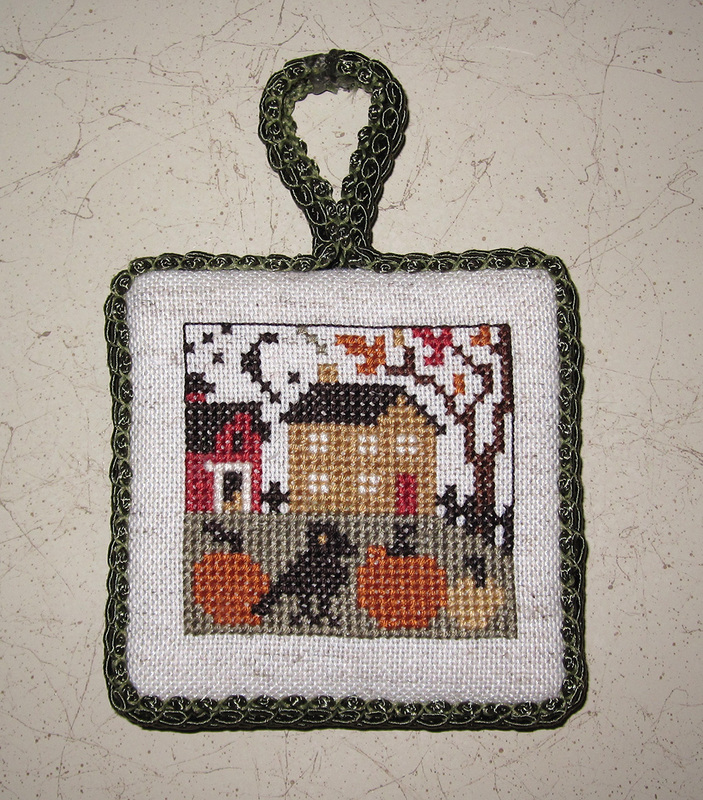 I know I almost never post these days, and one of these days I'll do enough stitching to actually write about it again, but I had to mark the 10 year anniversary of starting this blog. 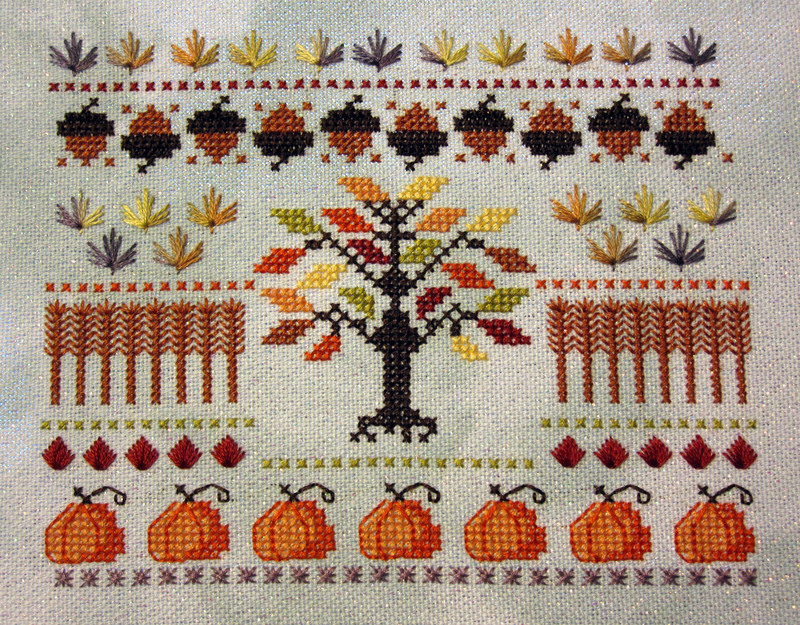 Even if I don't get a chance to stitch (or blog) nearly as often as I would like these days, it's nice to look back through some of the old posts and see what I've done in the past. 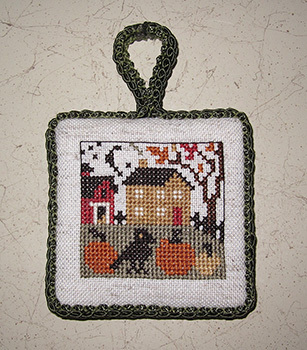 Although it does also remind me of the pile of things that I have finished the stitching on that still need to be made into ornaments or framed, etc. Well, Hurricane Harvey is likely to bring a very wet weekend to central Texas, so maybe that's one of the things I'll do to pass the time over the next couple of days! Well hello there random people who still periodically stumble across this blog! 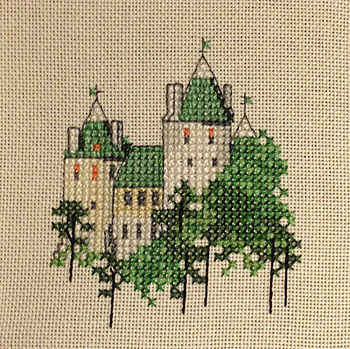 It's been a while since I've posted because I haven't done much stitching to post about. 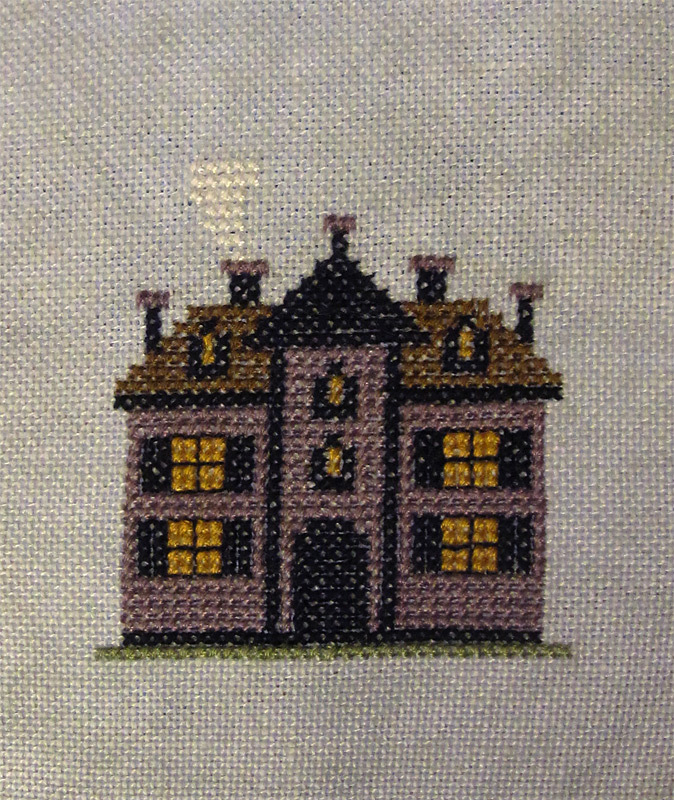 But as I sit down to write about the new year and my goals for 2015, I realized I should also mention the stitching-related ones here. Last year I did really good on my goal to frame/finish a number of projects (which you can see in the post from August), but I fell short on the number of projects I wanted to finishing stitching. I did manage a few, but not the 10 I was aiming for. 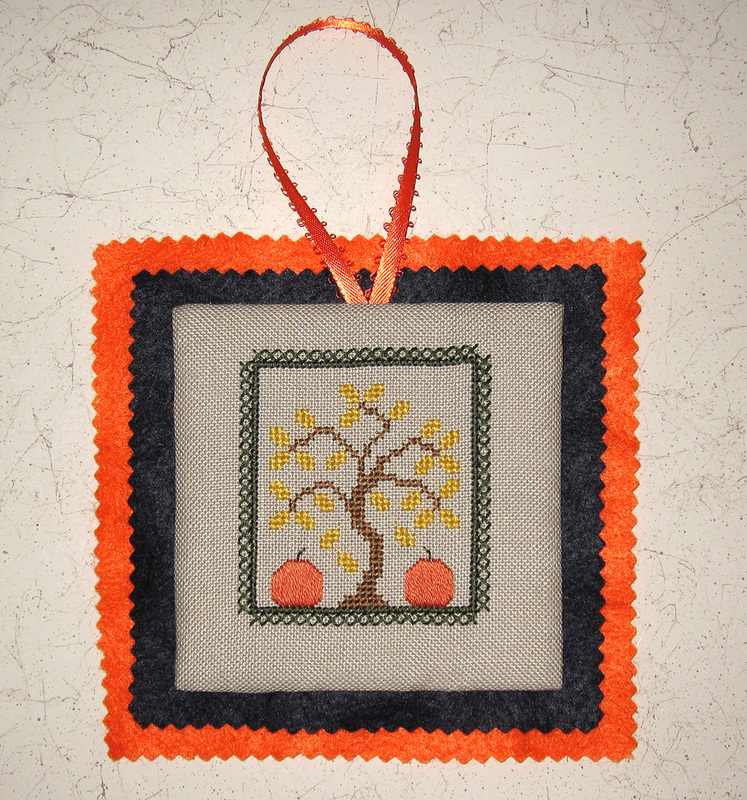 So, happy new year and let's hope I find more time for stitching and blogging about it! 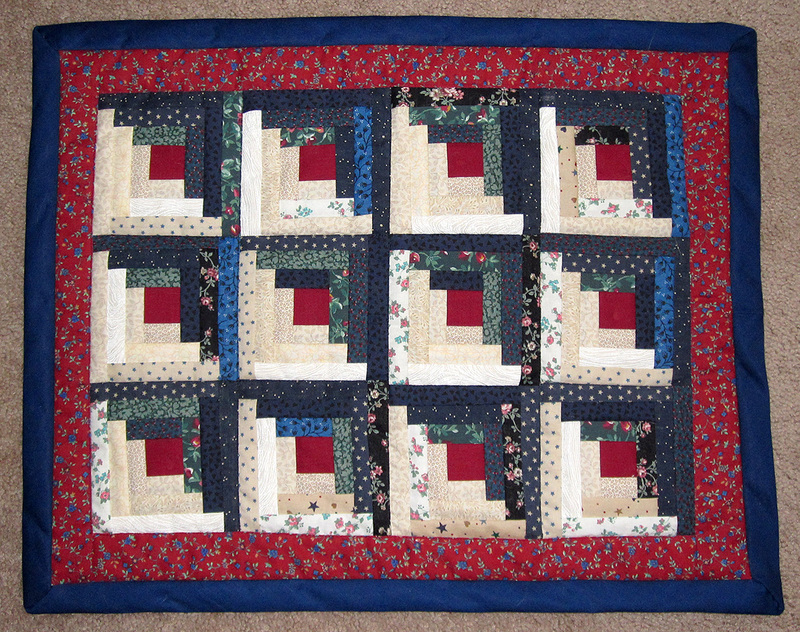 This is a mini log cabin quilt that had been waiting for me to put a binding on it for YEARS, which I finally managed to do a couple of months ago. And now for something completely different... 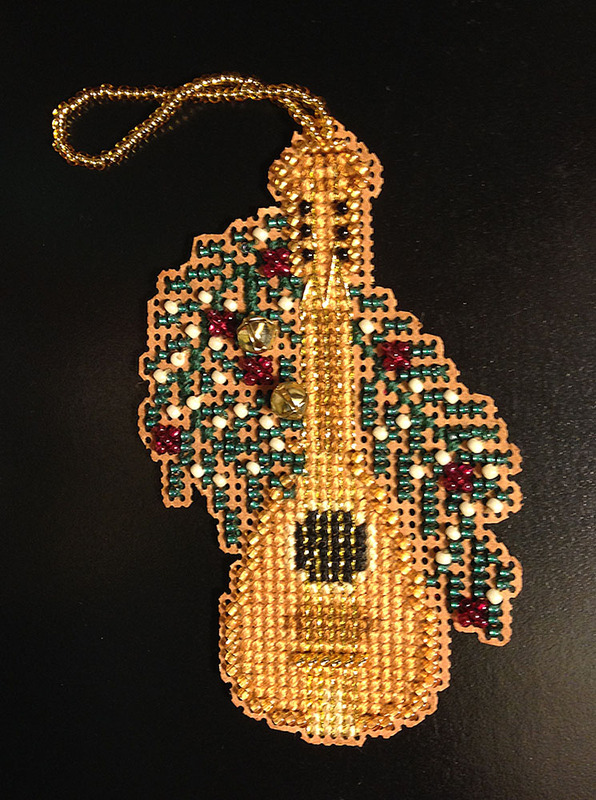 This is a bookmark I did of the Arecibo Message. 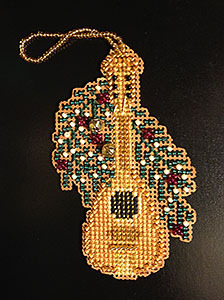 Only one Christmas ornament in this round-up. 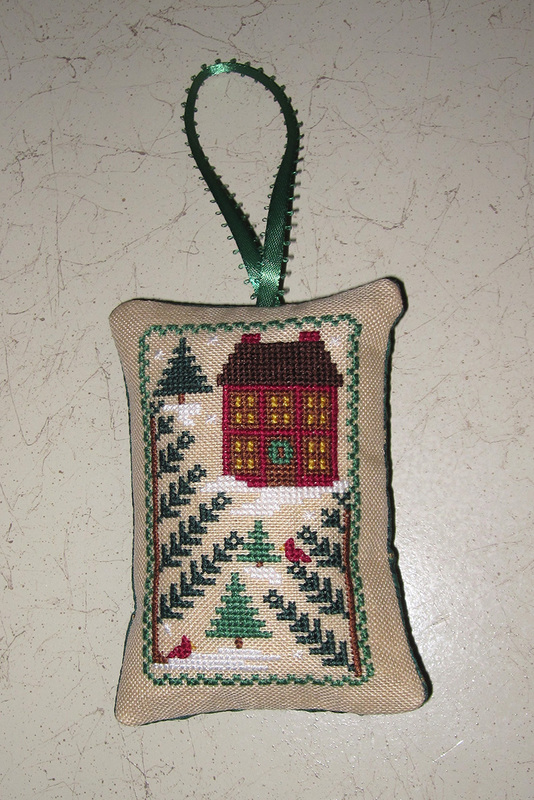 I finished stitching this back in 2011 and just now got around to making it into an ornament. And all of the rest of the projects that I finished were fall and Halloween designs (I think all of these came from various Halloween issues of Just Cross Stitch magazine.) 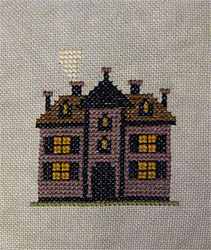 I realized long after I took the photos and cropped them down for posting that I should have also taken photos of the backs so you can see the coordinating fabrics I used, but I'm too lazy to do it now. But I'll try to more in the future, especially since I now have a bunch of cute Halloween fabrics to use on the many remaining Halloween designs I still have to finish. 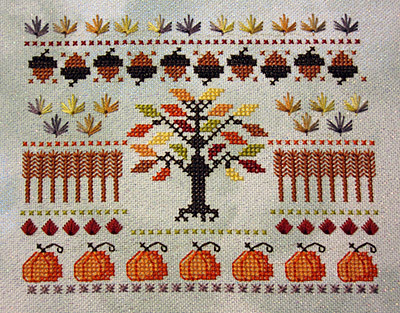 This is "Autumn Harvest" from the 2011 Just Cross Stitch September/October issue and I put the final stitches in a few hours before midnight on December 31, 2013. 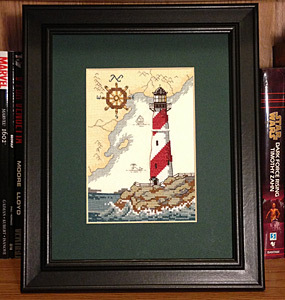 I mentioned in the previous post I have a few stitching goals, albeit modest ones, for 2014. 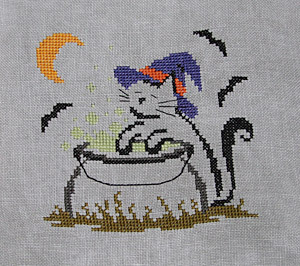 I am expecting it to be a very busy year so I don't think I'll have a ton of stitching time, but I do hope to meet my goal since I'm including small projects in the count. 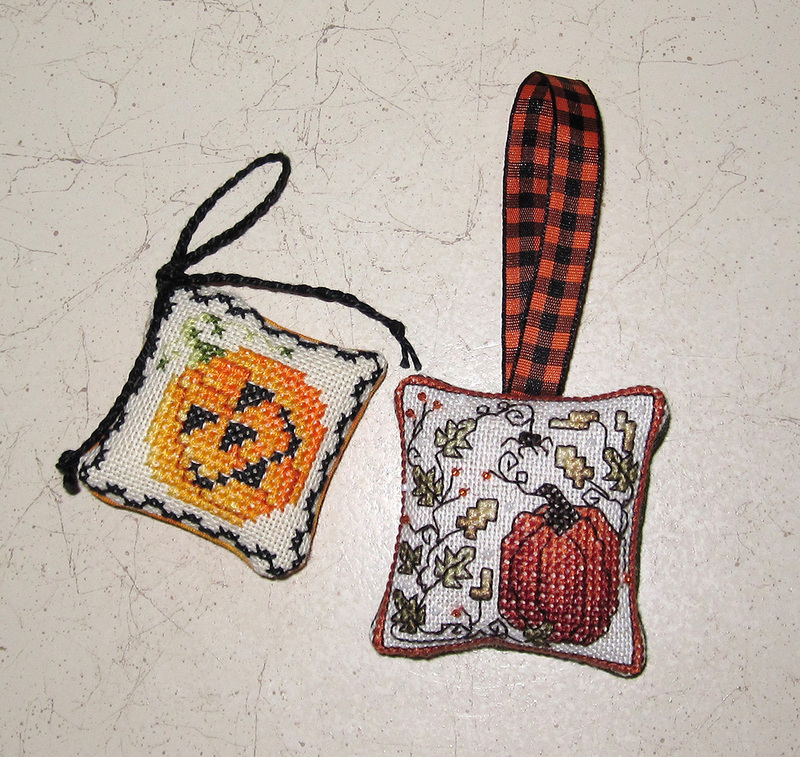 I think a bookmark that I started a year or so ago will be the first target for finishing since it is relatively small. Stay tuned for the occasional update! I'll have a proper update later since I finished stitching on one last project a few hours before midnight last night, but I wanted to put my stitching/crafting goals for 2014 here to keep me honest. 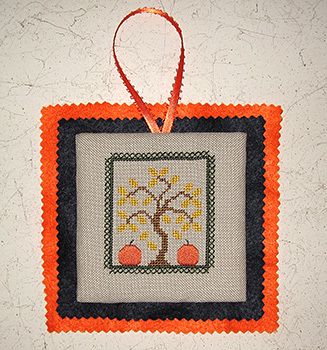 I've posted my whole list on my "everything" blog, but the ones for this blog are as follows: My goal is to frame (or finish into ornaments or whatever) six projects that I've already completed the stitching on and to finish the stitching on 10 projects (small ones count!). This won't make a huge dent in my backlog but at least it will be progress! This is from the Just Cross Stitch September/October 2011 issue. It's supposed to have a little string of beads and a specialty button hanging of the end, but I didn't have either, so I'm probably just going to leave it as is. When astronauts stay on the International Space Station, they usually have a little down time for personal projects. Probably the most famous use of that personal time was Commander Chris Hadfield's cover of David Bowie's "Space Oddity". But Astronaut Karen Nyberg's use of some of her personal time is something I can identify with a bit more - she's sewing in space! 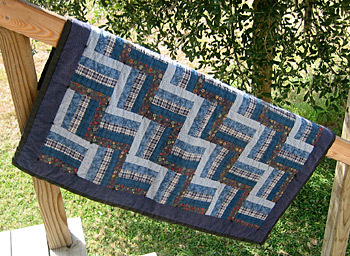 And as she mentioned in the video, she's working with the International Quilt Festival (headquartered, like the NASA Astronauts, in Houston) and is calling on quilters to contribute a quilt block for a project for next year's festival. You can find out more here (PDF)! I'm planning to contribute a block myself... I have lots of astronomical fabrics to choose from too. 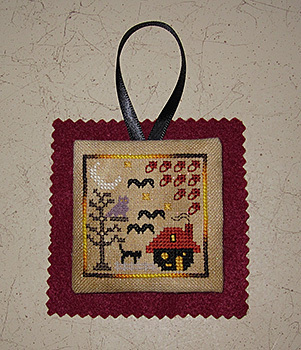 Besides quilting and love of space, one other thing that I have in common with Karen Nyberg is that we're Texas Longhorns! I got my Bachelor's in Astronomy in 1994 from (and still work at) the University of Texas at Austin and she got her Master's and PhD in Mechanical Engineering from UT in 1996 and 1998 respectively. Karen and two other crew members will be coming home from the ISS today. Safe travels! 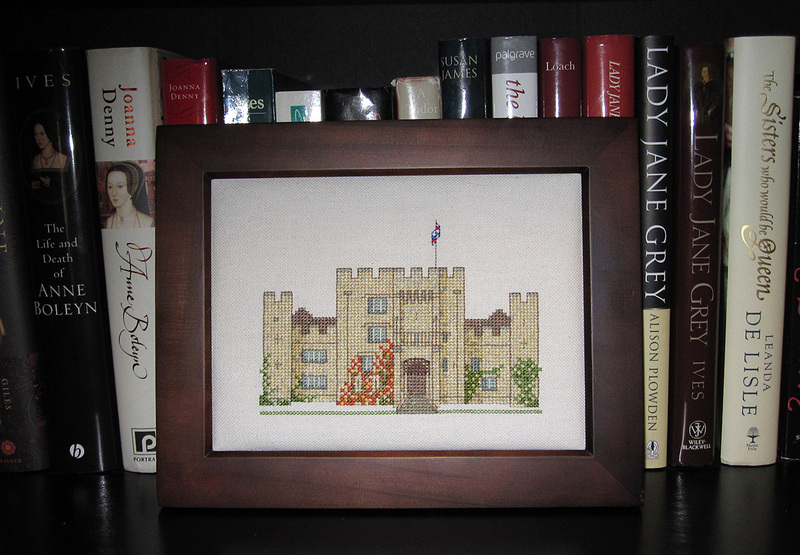 I have actually been doing some stitching! This was a Mill Hill kit that I picked up when my LNS closed last year. In hindsight, I shouldn't have backed it with a dark felt since now you can't see the antennae, but I'm happy with it. I have been going through my storage bins of old quilt projects to try to finish them up and make some space in my too-small-for-all-these-hobbies apartment. 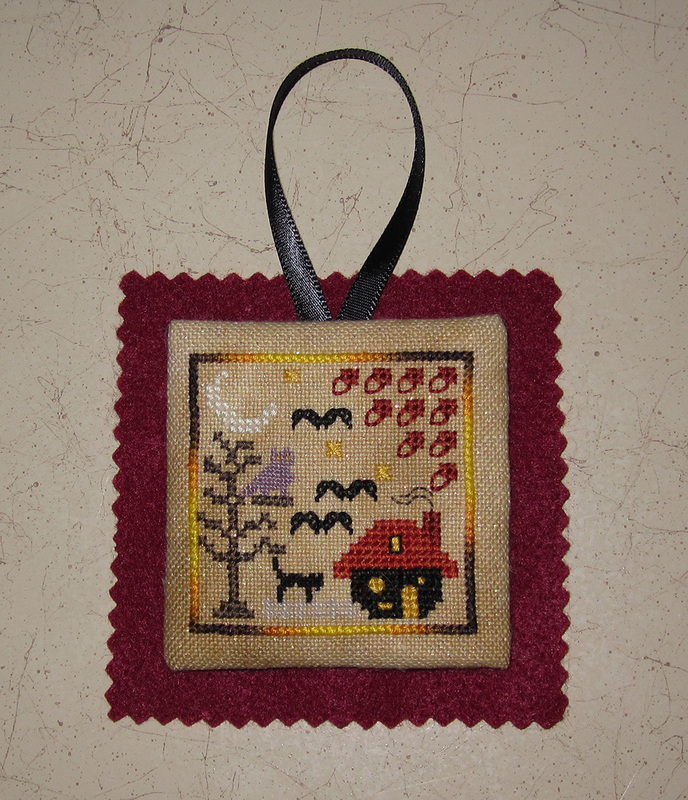 I had a few small blocks from a sampler quilt I started ages ago while I was first learning and then stalled on so instead of finishing the original project, I decided to just do things with the pieces I already had. 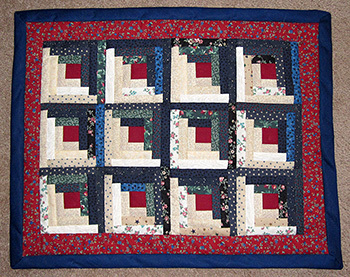 The first thing I did was sew the log cabin blocks that I did by paper piecing into a miniature quilt, which you can see in its almost finished state here. A few weeks ago I did the machine sewing for the binding, but it is still waiting for the hand stitching to finish it up. Of the remaining pieces, I had five blocks of an Ohio star design that I was trying to figure out what to do with when I thought that ornaments might be a good idea - especially since I have way too much fiber-fill around too. 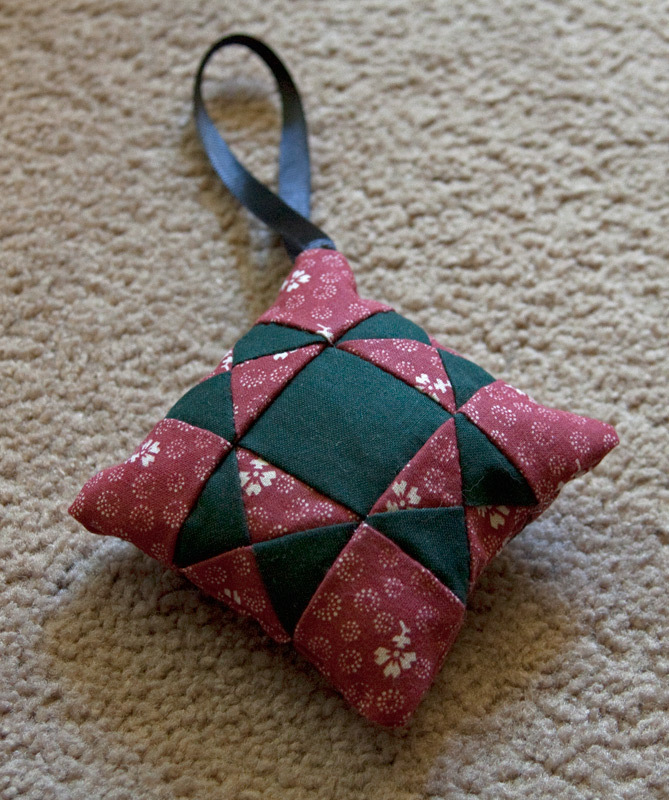 So I tossed the block that had some wonky alignment and made two ornaments out of the other four, a photo of which you see above. The colors are dark red and green, so they are good for Christmas, but I have them hanging on a peg board in my living room right now anyway. 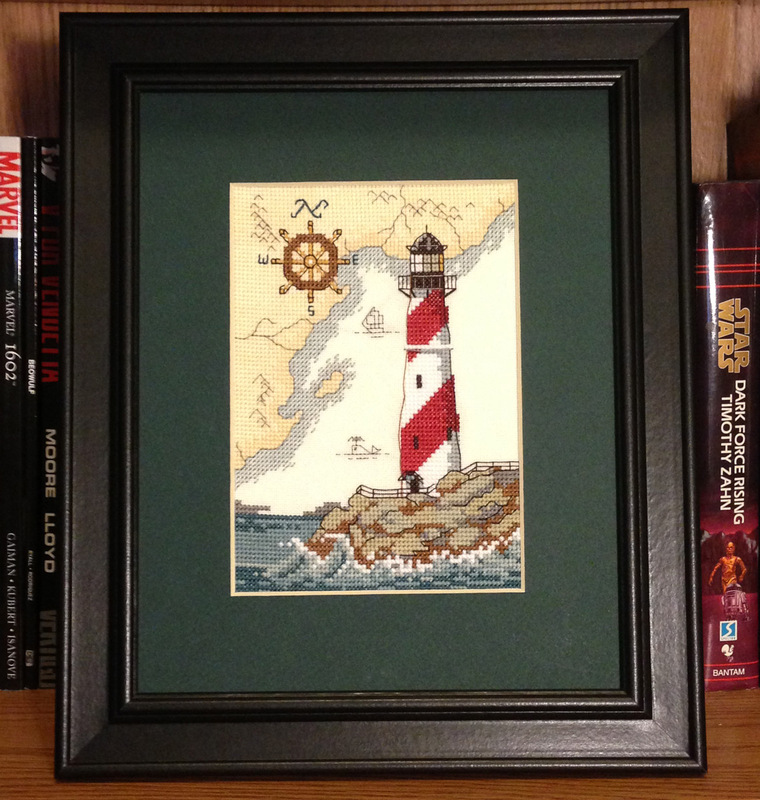 The other thing I did was to finally frame this old lighthouse cross stitch that I finished stitching ages ago (see previous mention here) but has been sitting in my "to be framed" pile ever since. One down... a gazillion more to go. For now it's on one of my bookshelves, but it may end up on the wall eventually. That's it for this weekend. I might be able to get a little more done over the long weekend coming up for the 4th of July, but as always, we'll see! 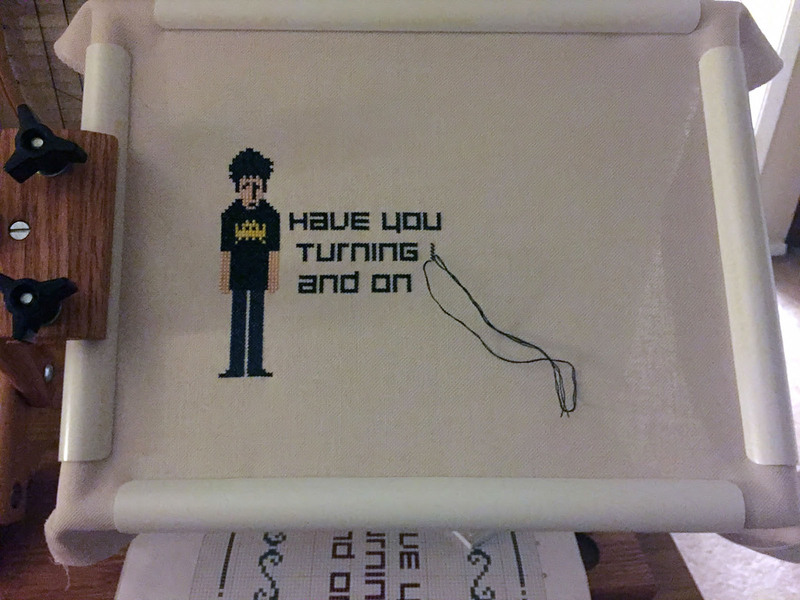 Yes, I finally finished the project that I showed in the post from last August! 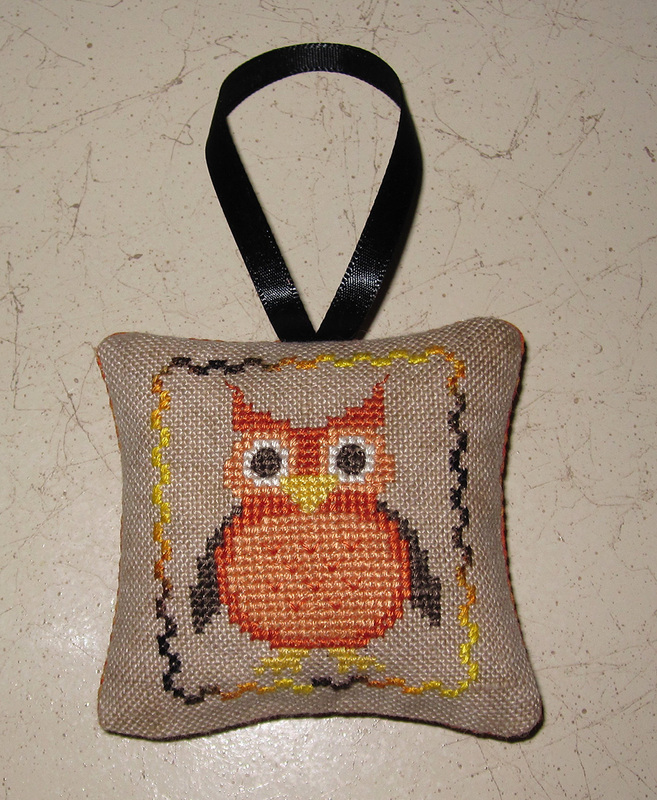 Needless to say, I haven't been doing a lot of stitching lately. Some of it is that my spare time was occupied with some of my other (way too many) hobbies, and some was that I moved some lights around and discovered the new arrangements weren't great for stitching (so I moved one of the lamps back to a better position). I might be getting back in to the mood to do some more, although I have that age-old problem of new things I want to start even though I have a bunch of other works in progress! 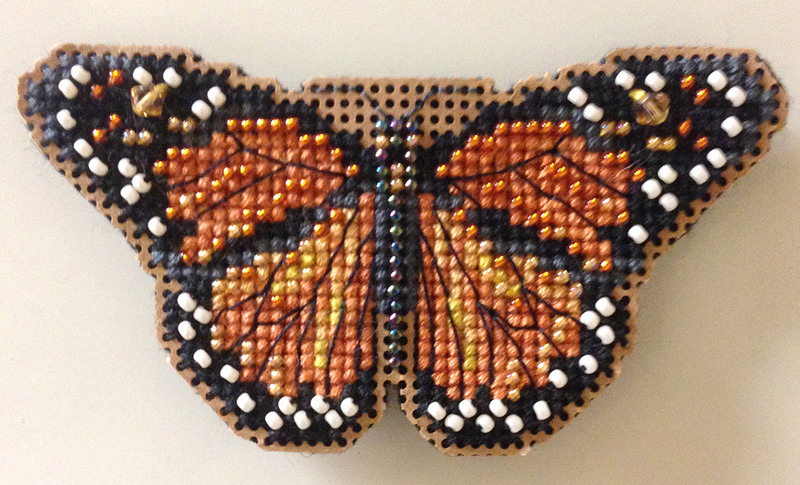 I think I'm going to do a cute monarch butterfly Mill Hill kit I picked up when my LNS closed last year and then tackle some stuff in my "to do" basket. 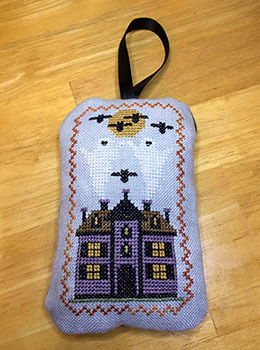 I just saw in the Nordic Needle's weekly newsletter that Marilyn Leavitt-Imblum of Told in a Garden (and Lavender & Lace and Butternut Road) has died. 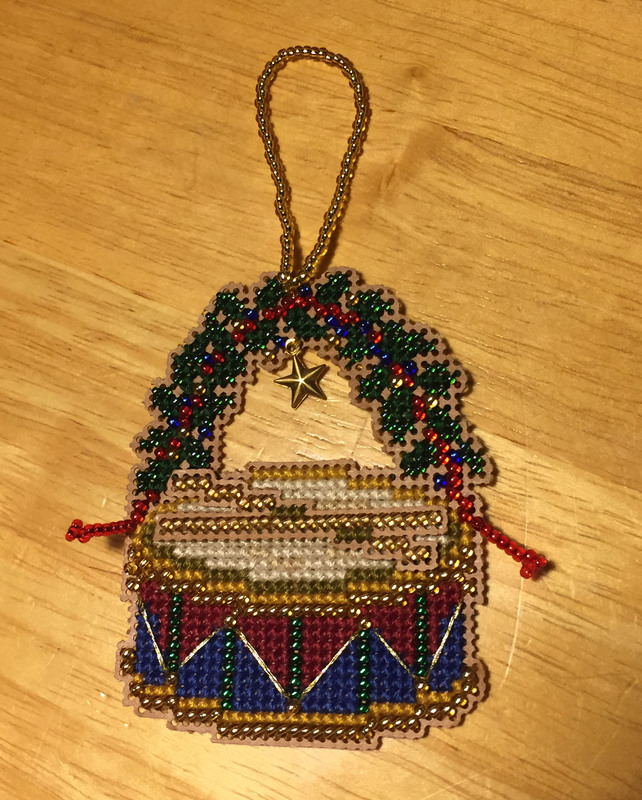 I've only stitched one of her designs to date - Celtic Christmas - but I have several others in my stash that I intend to get to one of these days. Thankfully her talent lives on in her daughter, Nora Corbett of Mirabilia Designs and in the many beautiful projects her fans have stitched, and will stitch, from her designs. Marilyn L. Imblum obituary from the Finger Lake Times. I feel a little ashamed to be celebrating the 5th anniversary of this blog given that I update it so infrequently! 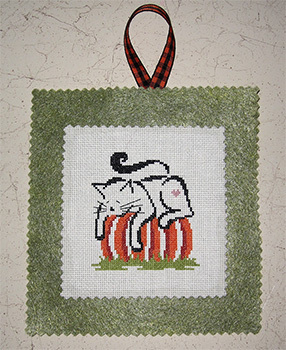 I thought I would have some time over the summer to get more stitching done, but the time just didn't materialize. A combination of a really busy summer at work and the fact that it wasn't atrociously hot this year just made it fly by. This year the summer was pretty mild other than a short stretch in June and we've actually had some rain. And, most importantly, everything's not on FIRE here in central Texas this year. 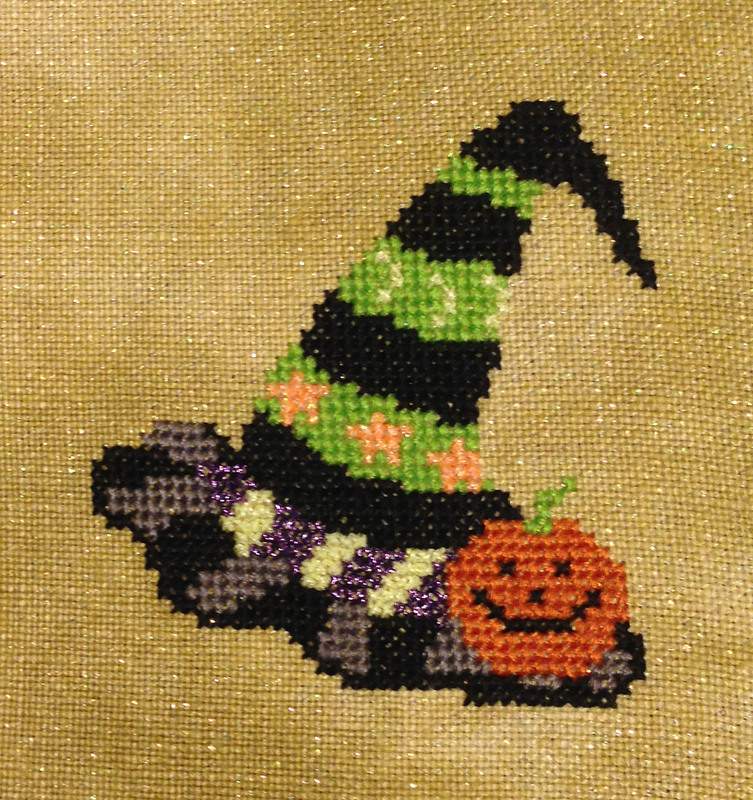 I have one or two small Halloween projects in the queue and then maybe, just maybe, I'll tackle some of those larger projects that I've only barely scratched the surface on. I managed to squeeze in another quick finish before heading back to work tomorrow! 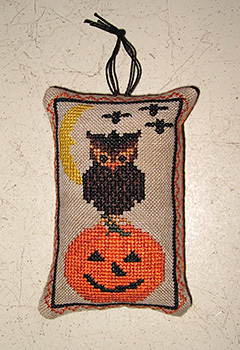 This is another one from the 2011 JCS Halloween ornaments issue. I used DMC for the stitching except the border, which is a Weeks Dye Works thread that I had bought for another design that I thought would look cute here (and the colors did match great!). I still have two more designs from that issue in the works, but I have no idea when I'm going to get around to finishing them since I have a feeling this is going to be a fairly busy summer, at least through July. 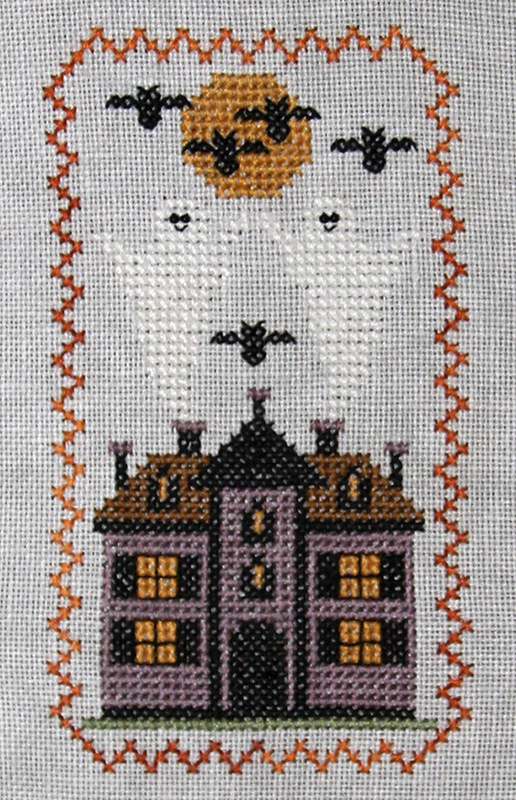 I'm really hoping for a calm August since it's usually so hot outside that it's a good time to sit inside and stitch!